NO SAFETY ISSUES WHEN INTERVENING ON A COLD ENGINE. 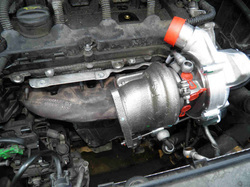 Replacing the turbo without looking into the cause of the failure and correcting it will lead to immediate damages to the new turbo. 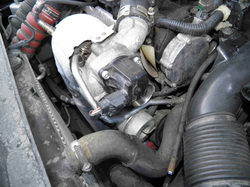 Refer to the page "Turbo environment diagnostic" and apply the fix prior or in parallel to the turbo replacement. Drain the coolant and disconnect the battery. You would need to drain the oil. See page "Turbo environment diagnostic". 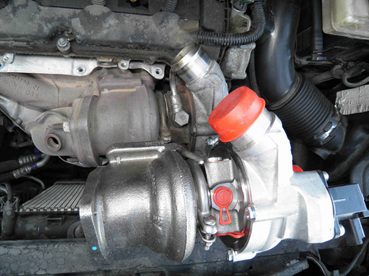 The below operation requires to dismantle the catalytic converter first, visit our page "Front-mount catalytic converter removal"
The below works concerned a Peugeot 5008 equipped with a turbo-charged EP6 engine and a Borg Warner turbo. The most difficult part of a turbo replacement is its purchase! 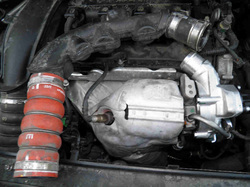 Note well its make and model no and contact both your vehicle after-sales services and the turbo brand representative. The dealer could propose an equivalent model number which is normal. Just make sure you ask him to confirm the match between the proposed number and the one on your plate. It is usually advised to buy it from the dealers of the turbo manufacturer. You could save up to 70% of the turbo price! The first thing to do is to place it on top of the defective one and make sure it matches. 1- Having disconnected the battery, remove the electrical connector and vacuum tube from the turbo. 4- Repeat the same on the banjo-bolts of the coolant supply and return tubes. 7- Pull out the complete manifold/turbo assembly. 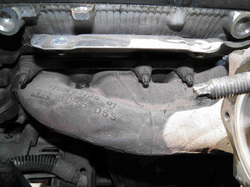 2- You had removed the catalytic converter prior to this step (see our related page). Now unscrew the nuts holding the exhaust manifold. 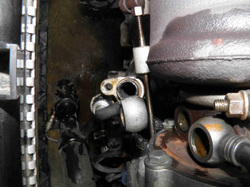 5- This is why you should have drained the coolant prior to reaching this stage. 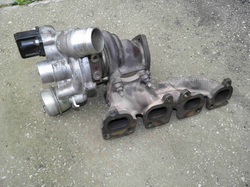 8- Separate turbo and manifold. 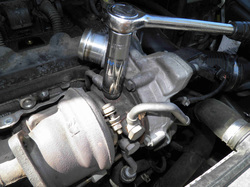 3- Remove the banjo-bolt of the oil supply tube. 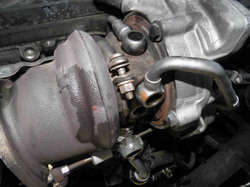 A little oil should show and the bolt should be clean and unclogged. See the page "Turbo environment analysis". 6- Now unscrew the oil return hose from below the turbo. It is seen here pointing towards the reader. 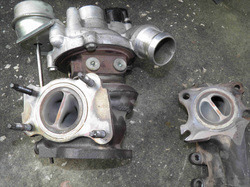 Fit a new turbo gasket and re-assemble turbo and manifold (left). 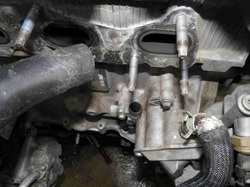 Vacuum carbon and corroded metal particles that are trapped behind the manifold and make sure your engine block is clean and ready for re-assembly (middle). 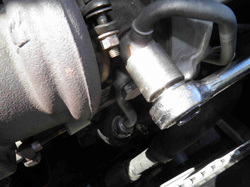 Fit a new oil supply tube with two new copper ring seals and a new oil return hose (right). 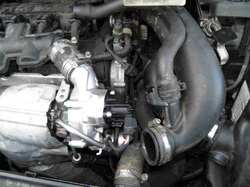 Reinstall the manifold/turbo assembly. If this was the first time you had dismantled them, you can keep the same manifold metallic gasket. If not, replace it (left). 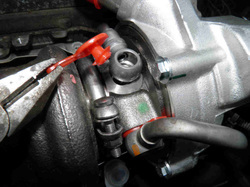 Prepare your turbo for banjo-bolt refitting (middle). 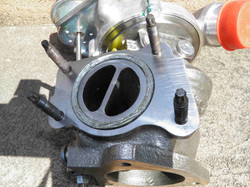 Pour some oil in the turbo oil hole to help it spin at first ever use. 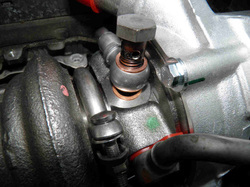 Systematically replace the oil supply banjo-bolt and all copper ring seals (right and lower pictures). 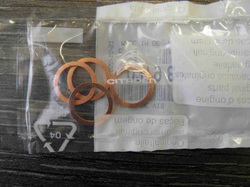 Copper seals are so cheap. ​In no case you should re-use the dismantled ones. Refill with coolant. To avoid purchasing a specific funnel, unscrew the expansion box and lift it up, Temporarily hold it with tape or a cable tie. 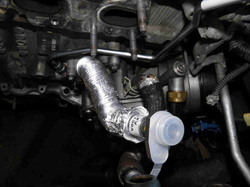 Fill with excess coolant and open the purge valves. Refit the box in place and adjust the level. Refit the catalytic converter, air hose, sensors, electrical connectors and vacuum tube. Refit the air filter hoses, reconnect the battery. You are now ready to start your engine. Do not forget to erase any codes you had got in ECU.